L-R: Elma Kamari Bidgorpeh (SoCal) 1st Vice President, Seigefred Pue (Nebraska) Corresponding Secretary, Fergielynd Andres (Nebraska) Recording Secretary, Yvonne Agatep-Cortez (Indiana) Treasurer, Agnes Sajulla (Nebraska) Asst. 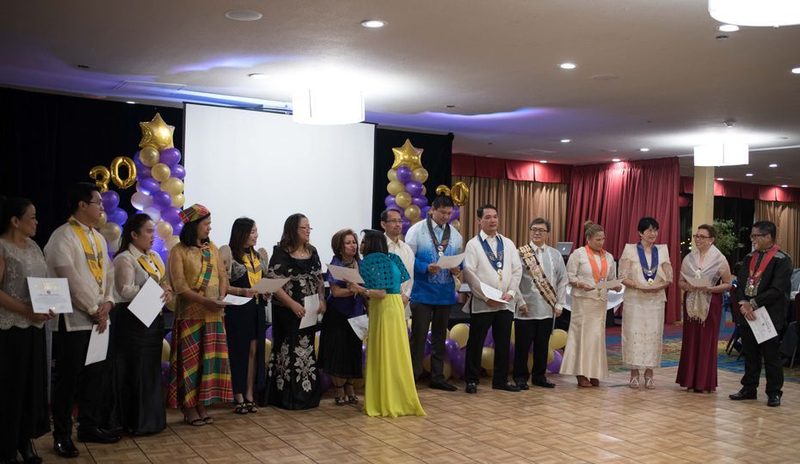 Treasurer, Lourdes Delgado (Texas) Board of Director, Ofelia Corpuz (SoCal) Treasurer, Nile Alconcel, Inducting Officer (Michigan), Alan Calaor (Florida) Board of Director, Carlo Ledesma (Oklahoma) Board of Director, Marvin Hernandez (New York) Board of Director, Angel Mercado (Nevada) Board of Director, Maria Caren Daligdig (Texas) Public Relations Officer, Ampy Gallardo (Michigan) 3rd Vice President, Jela Ibarra (NoCal) 2nd Vice President, Rex Famitangco (Nebraska) President. (NY), Rex Famitangco (NE), Vee and Art Trinidad (So CA), Cora Sopena (Midwest), Virgie Quintin (Nevada), Let Negado (San Diego, CA). Myrna de Jesus (So CA), Agnes Barba (So CA), Vashti Rivera (So CA), Dr. Shirley Cruzada (NV), and Ampy Gallardo (MI).